You are currently browsing articles tagged Irish hotels. 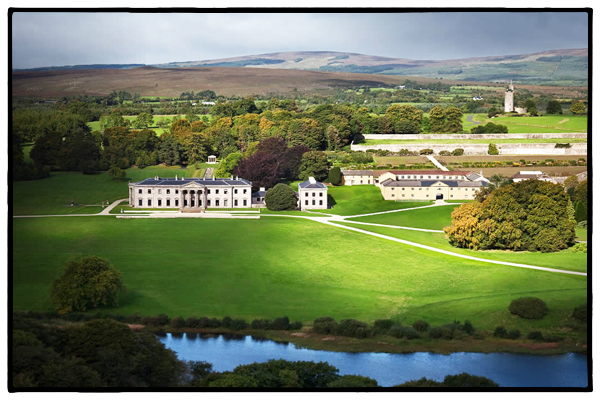 Ballyfin Demesne–let them eat cake! Ballyfin Demesne with the lake in the foreground and the stone tower folly in the right hand corner. Or at least, that’s what I thought he was saying. Actually he’s saying “Ballyfin demesne.” Which is pronounced pretty much like domain, the French word from which it is derived (the “s” in demesne is silent). Demesnes are pretty much English and Irish inventions. Elizabeth Bowen, the Irish novelist and short story writer, called Irish demesnes “house islands,” which seems like an apt description. They were particularly popular in the 18th and 19th century when, according to one Irish source, as much as 5% of all the land in Ireland was considered a demesne. The idea was that you built your estate—like Ballyfin—out in the middle of nowhere, surrounded it with high walls, and then the peasants who would come to feed and bathe and dress you would establish themselves nearby. Not on the estate, mind you. But just outside the walls. So you didn’t have to see them. So a baron like Sir Charles Coote who built Ballyfin, could wake up in the morning and, while scratching his belly, look out on the 36-acre man-made lake in front of his house and his acres and acres of woodland and not have this idyllic vision marred with peat smoke from tiny thatched cottages and peasant women hanging laundry. 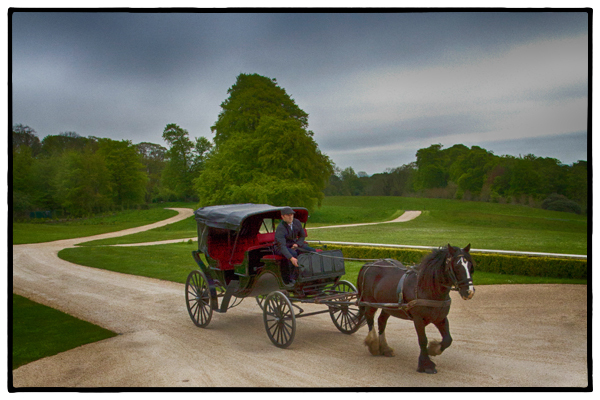 A carriage pulls up before Ballyfin to give us a tour of the 640-acre estate. Photo by David Lansing. Late in the afternoon we went for a carriage ride around the estate ending up at a five-story medieval-style stone tower perched on a hill with views of the Slieve Bloom mountains. The tower is a folly, which means there was no practical purpose to it; it was built solely for decoration. Actually, that’s not completely true in the case of the Ballyfin Tower. It was built by the original owner, Sir Charles Coote, in the 1860s in a bid to give jobs to the local population during the potato famine. So it at least served some purpose. 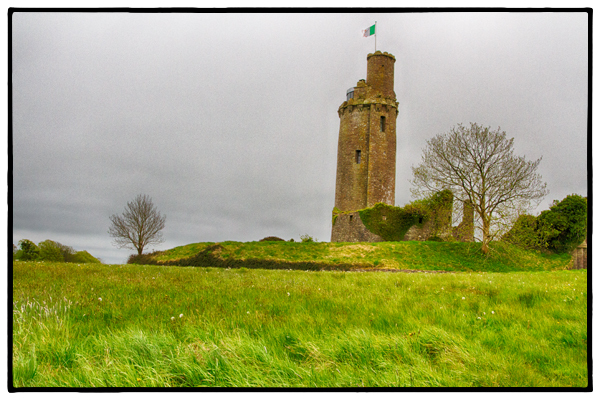 The Ballyfin Tower, built as a folly in the 1860s. Photo by David Lansing. When we got to the top of the tower, there was a young Irish couple up there. We’d noticed them earlier having tea in the library. The young woman’s face was mottled and she was dabbing at her eyes with a tissue. Seeing our concerned look, she smiled and cried at the same time. “He’s just proposed!” she blurted. The young man told us the story: He’d lured the young girl out to Ballyfin to have tea, which appeared to be quite the coup since the hotel is only open to those staying there (no lookyloos). After tea, he’d suggested they climb up the tower for a quick peek before leaving. Then he’d dropped to one knee and presented the ring. All very dramatic. Imagine telling that story to your children one day. No doubt he’s right. I have a feeling we won’t see them at dinner.